Davallia solida (G.Forst.) Sw., Schrad. J. Bot. 1800(2): 87. 1801; Christ, Bot. Tidsskr. 24: 110. 1901; C.Chr., Bot. Tidsskr. 32: 345. 1916; E.Smith, J. Siam Soc. Nat. Hist. Suppl. 8: 3. 1929; Tardieu & C.Chr., Fl. Indo-Chine 7(2): 104. 1939; Holttum, Rev. Fl. Malaya ed. 1, 2: 360, f. 207. 1955 [‘1954’]; Holttum, Dansk Bot. Ark. 23: 234. 1965; Seidenf., Nat. Hist. Bull. Siam Soc. 19: 86. 1959; Tagawa & K.Iwats., Acta Phytotax. Geobot. 23: 54. 1968; T.Sen, U.Sen & Holttum, Kew Bull. 27: 226. 1972; Tagawa & K.Iwats., Fl. Thailand 3: 163. 1985; Nooteboom, Fl. Males., Ser. II, Ferns and Fern Allies 3: 263. 1998; Boonkerd & Pollawatn, Pterid. Thailand: 170, 234. 2000. – Trichomanes solidum G.Forst., Fl. Ins. Austr. : 86. 1786. – Type: Forster 308 (BM holo; P), Pacific Islands. Rhizome long creeping, 6– 12 mm diam., scaly throughout; scales oblong-subtriangular, gradually narrowing towards apex, 4–5 mm long, apical part thin, pale brown, with dense hairs about 1 mm long, caducous, basal portion dark brown to nearly black, imbricate; old portion of rhizome covered by these basal portion of scales up to 3 mm in length. Stipes stramineous or sometimes brown, 9–35 cm long. Lamina subdeltoid, 15–90 x 21–40 cm, tripinnate; lateral pinnae subopposite; all pinnae anadromous; basal pinnae the largest, oblong-subtriangular, with distinct stalk; pinnules stalked, oblong, cuneate at base, gradually narrowing towards acuminate apex; secondary pinnules (ultimate segments) narrowly oblong, sessile, narrowly cuneate at base, moderately acute at apex; axes distinctly grooved, grooves decurrent to each other; veins visible, but not raised; glabrous or with finely branched wooly hairs sparsely scattered beneath and at main junction points. 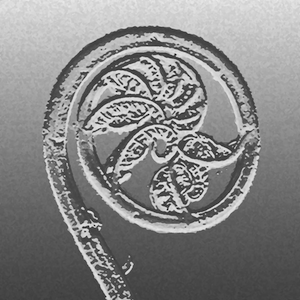 Sori terminal on veinlets, at margin of ultimate segments; involucre cup-shaped, up to 1.5 mm long, about twice as long as wide. SOUTH-WESTERN: Phetchaburi; SOUTH-EASTERN: Chanthaburi, Trat; PENINSULAR: Ranong, Surat Thani, Phuket, Nakhon Si Thammarat, Trang, Songkhla, Yala. Widely known in Malesia and Polynesia, north to Indochina and S China. On tree trunks or on rocks in half-shaded places or in some dense evergreen forests at altitudes below 300 m.
The sterile leaves are less dissected and thus the species is subdimorphic in appearance. The size and form of fronds as well as their dissection are to some extent variable, according to available light and moisture. Middleton et al. 4373, Nakhon Si Thammarat, Khao Luang National Park (E). Bouillod 5, Kampot (P); Viboth R3-49, Koh Kong, Thma Baing (P).